Norway is known for their coffee, which made the prospect of visiting a local coffee shop very exciting for us. And when we discovered that a local shop was located just down the street from our hotel, we determined that it would be out first taste of Norwegian coffee. 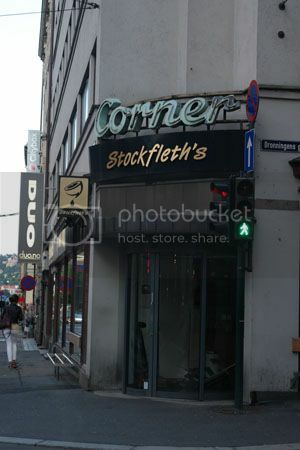 The shop that we visited is called Stockfleth’s and we were at the Prinsens gate location, which is apparently the largest one for this chain. It is actually a two-story cafe, with the larger seating area being below street level. Prices here are typical of what you see in Oslo – around 35 NOK for a cup of coffee. The end result here is a very satisfying and very smooth cup of java. Do note that by American standards, this is a very small cup of coffee. And for junkies like us, not nearly enough! If you’re hungry, they also serve food that you can eat downstairs (or in one of the stools by the window or on the benches outside). Would we drink coffee from Stockfleth’s again? Yes! You can find this location in the Sentrum (old city center) at Prinsens gate 6, 0152 Oslo. If you plan on drinking your coffee inside (or eating something there), then you’ll likely be interested to know that they do offer free wi-fi access. You just need to get the password at the register when you pay for your drinks and food. And don’t worry about the language barrier as the staff spoke perfect English when we were there.